Gorgeous containers filled with flourishing plants don’t have to be exclusively found in magazines or on TV. The key to a successful container garden is to first create the ideal environment for your plants, and then apply basic design principles to create a cohesive look. Don’t let this overwhelm you – with our basic container gardening secrets, you’ll have the most envied garden in your neighborhood! There’s more to picking the right container than meets the eye – literally. Sure, you want one that’s going to look nice and matches your color scheme, but you also want to consider other qualities, too. Containers house the root systems of your precious plants and should create an ideal growing environment. First and foremost, consider the heat and moisture requirements of your plants. What many people may not consider is how the material of the pot can affect the conditions inside. While terra-cotta is a classic look, it’s also a very porous material. 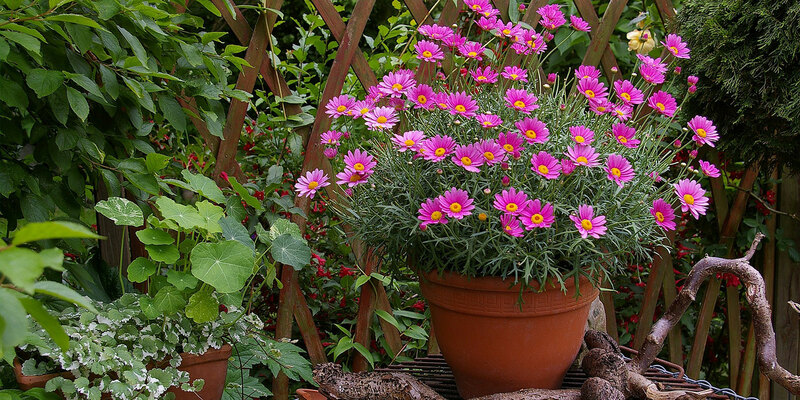 In dry weather, terra-cotta pots will absorb moisture from your plants’ roots. Luckily, the warm, humid Florida climate makes terra-cotta a little more manageable than in other parts of the world! Just keep a close eye on soil moisture during dry periods. Containers made from synthetic materials, such as lightweight, high-end fiberglass or resin, are great for your plants’ roots but can be hard on your wallet. However, their durability might be something worth splurging on, especially during hurricane season. 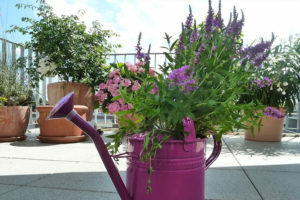 The color of your pot is important not only for your design scheme but also for your plants’ wellbeing. 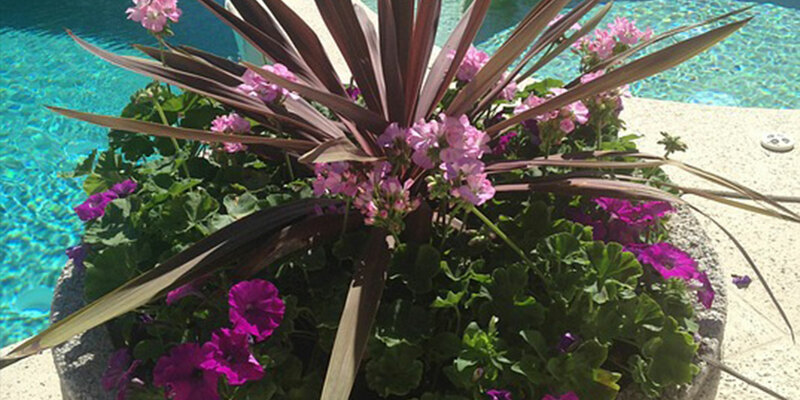 Dark pots will get extra hot in the sun, especially here in the Sunshine State! It’s best to save these for your heat-loving plants, choosing lighter colors for the more delicate ones. Select a container with good drainage. Unless you’re growing aquatic plants, most container-grown plants need good drainage, otherwise, the plants can develop root rot from sitting in collected water. Look for a pot with drainage holes, or carefully drill holes in the bottom of the pot. In a closed system like a container, we need to pay extra attention to the environment we’re creating for our plants. Since their roots can’t reach out and find water themselves, it’s our job to maintain the moisture content and keep our plants healthy. Letting soils dry out repeatedly puts a lot of stress on root systems and can lead to irreversible damage. Tropical species, in particular, don’t fare well with dry conditions and will become dull with the stress. Naturally, many gardeners combat arid soils with constant watering. Although it’s effective, this can become an exhausting and annoying task. Adding a couple of inches of mulch is a great way to moderate soil moisture, as it slows the evaporation of water into the air and helps keep the soil cool. Avoid choosing inorganic mulches, like rubber or rock, since they can heat up pretty quickly in the hot sun and actually dry soil out even faster! Remember, too, that container gardens need to be fed. Because containers require almost daily watering, depending on heat, nutrients leach out of the soil as the water drains from the container. Use a good, organic fertilizer and follow the directions on the label to keep your plants healthy and blooming. Once you’ve got your containers and their contents figured out, the hardest part is done. However, you don’t want to dive into planting quite yet. 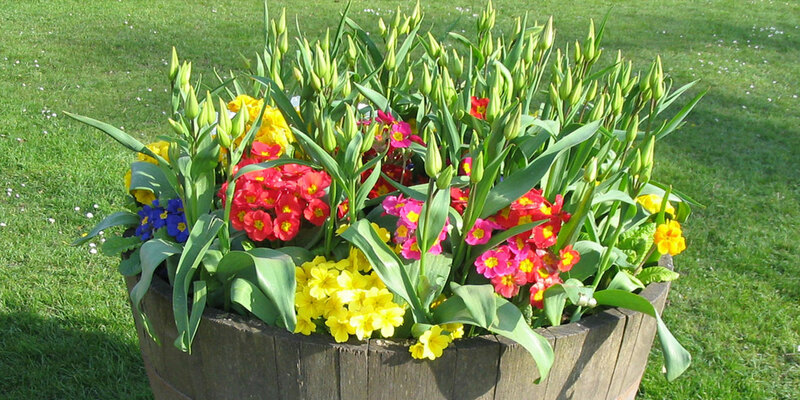 Play with your options first, setting plants into containers to see what they will look like. Consider how that will change as they grow larger. Oftentimes the design we’ve initially planned in our heads will look different in person. Color schemes: Analogous colors, or colors that are similar to each other, create a sense of harmony. Complementary colors, which are opposing colors on the color wheel (ex. yellow and purple), create eye-catching contrast. This can be applied to both the containers and the plants in them. Focal points: This is the plant in your container garden that defines and anchors the design scheme. It’s the first thing your eye is drawn to. While this is often the largest or showiest of your plants, it doesn’t have to be! Plants can be emphasized by altering the scale and flow of their surroundings. Texture: Sticking to similar textured plants contributes to harmony, since it creates very little tension. On the other hand, mixing contrasting textures excites the brain a little more. This doesn’t have to be overwhelming, though – blend soft and bold textures for a good balance. The key to a beautiful container design is to choose and place each element of the container garden to complement the rest. You want to avoid a boring container garden without overdoing it. While design is a matter of taste, the most important thing is to keep your container garden healthy. Strong, vibrant plants are always in style!